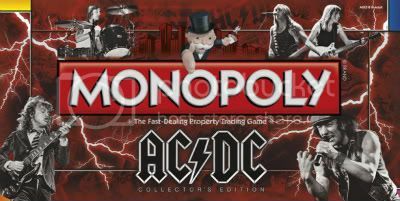 According to USAopoly, AC/DC Collector's Edition Monopoly is going into production next week. The game will be available this August. Created with loyal fans in mind, this AC/DC Collector's Edition Monoppoly game's custom gameboard features the best of one of the greatest rock and roll acts of all time. Includes custom properties, cards, houses, hotels and tokens. Singer Brian Johnson has no firm idea about AC/DC's next move after the long cycle supporting 2008's Black Ice, but he's hoping there won't be another eight-year interim before the band's next project. "I'll be six feet under by then, so no," Johnson told Gary Graff from here recently. "We never say 'no' and we never say 'never.' If we can get out an album and do another short, little tour or something, have a bit of fun, I'll be right there. The thing with the boys in AC/DC you've got to remember is we're constantly surprised and amazed at how we keep the success going. We don't know what we're doing - I mean, we literally don't know what we're doing except that we just play 100 percent every night and give it everything we've got. If that's the secret to success, we'll pass it on." Johnson recently released his new book, Rockers And Rollers: A Full-Throttle Memoir. From 'Pink Cadillac' to 'Low Rider' to 'Little Red Corvette', rock music has always had a racy love affair with cars. And AC/DC lead singer Brian Johnson is not only a rock legend, second-to-none at infusing razor-sharp lyrics with the screaming metal energy of a true rock and roller, but also a dyed-in-the-wool car fanatic. 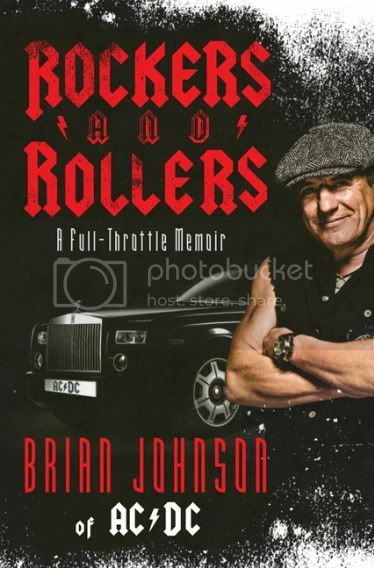 Books like AC/DC: Maximum Rock and Roll and Why AC/DC Matters revealed the secrets of the the world’s greatest rock band—now, in Rockers and Rollers, fans will get a rare, riveting window into Brian Johnson’s other driving passion, his love for automobiles. From teenage memories in the backs of beat-up coups to a side career as a racecar driver, Johnson shares his tantalizing life story—a memoir told through his lifelong love affair with cars. By night, Brian Johnson sings in the biggest rock ’n’ roll band on the planet. But by day, AC/DC’s frontman drives balls to the wall. Cars and rock ’n’ roll—they were made for each other. When he was a young boy growing up in a working-class English town, Brian developed what would become a lifelong passion for cars, trolling junkyards and even pretending to drive the family car. From there, he steamed up the windows of his old Mini Cooper as a teenager, spent untold time in hygienically challenged tour buses with helpful signs such as No Shitting Allowed. Shagging Expected, was chauffeured in leather-trimmed limos, and raced cars to a checkered flag. Featuring guest stars Cliff Williams, Malcolm and Angus Young, and many, many others, even Arnold Schwarzenegger, Rockers and Rollers is a tribute to Brian’s obsession with four wheels. By turns surprising, poignant, funny, and maybe a little bit bawdy, these are the stories of a man who drives as hard as he rocks.